Happy National Noodle Day! You may say...Coffee, with soup and noodles? I had to give it a try! I knew with this recipe I was going out on a ledge, and there was no way I was going to divulge any of the ingredients to my children, beyond, of course, the noodles and butter! I have to admit, it was fun to pour in the 2 cups of hot coffee to the mixture of ingredients. I felt like a kid in a science class working on an experimental substance. I was very tempted to pour in some hand soap to but, refrained. 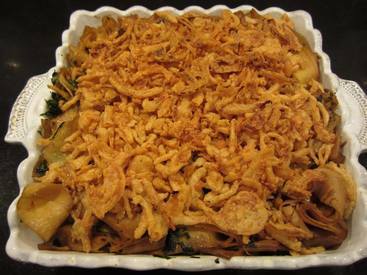 The recipe includes french fried onion rings as an optional topping. I knew I’d need all the help I could get to win my kids over with this dish. I needed to disguise the coffee and spinach in the casserole, so of course, I opted to generously layer them on top!